Sometimes, a simple song – 4 minutes of music and words – can take years to create. “The Movement”, an upbeat, high energy song off my latest album, Wizdome, aims to inspire youth to move quickly and take action. Ironically, the song and video actually took quite a bit of time, with several lapses in progress, to fully come to fruition. The idea for the song actually came about way back in the summer of 2013, on the cusp of the 114 youth conferences happening worldwide that had been called for by the Universal House of Justice, the supreme governing body of the worldwide Baha’i community. We had such a gathering scheduled for Phoenix in the month of July, and leading up to the conference, there were many efforts to invite youth from the Valley into the Baha’i community building process. One such effort, initiated by some friends of mine, was a community space called a “Soul Slam”. A Soul Slam is basically an event where participants share expressions of the arts, focusing on spiritual themes, such as unity, love, and justice. At the event, me and my friend Kishan thought it would be cool to perform a rap for the audience. During one of the performances, we snuck away to another room and brainstormed ideas that related to inviting young people to the youth conference. Like magic, we came up with a call-and-response: “Get down with the movement!” / “Calling all youth!” Kishan and I each then wrote a few short rap verses, and then we went back into the main hall and performed our rap. This call-and-response would later become the chorus for “The Movement”. Thanks Kishan!! Kishan and I are hoping to do a remix of the song at some point in the future… :). After reading through these stimulating materials, I decided to write some rap verses about it. After writing my verses, I performed them as spoken word poetry at a few gatherings here and there, but it wasn’t until December 2014 that the song would really come together. I was visiting my friend Awu in Cameroon, along with my father Richard, wife Mallory, and good friend/cinematographer Brian. 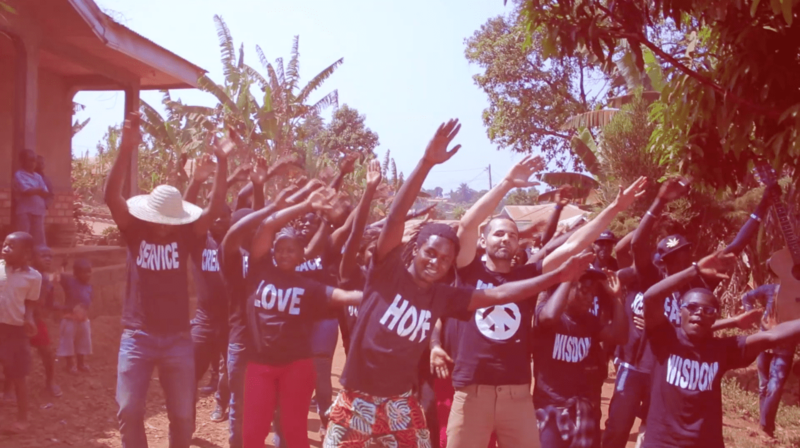 We were travelling to Cameroon to film music videos for the songs “Change the World” and “Paradigm”, as well as do some volunteer work with Cameroonian NGO The Greens. Upon our arrival into Bamenda, Cameroon, I shared the new rap lyrics with Awu, and expressed my desire to compose a new song during the trip. I also shared the hook Kishan and I had created as inspiration for the chorus. A couple of days later, Awu and I met under a big mango tree near his house, and let the creativity flow. Within a few hours, we had come up with “The Movement”. We took the song to his friend Noley, who is a beat maker and producer. He came up with a beat on the spot, and a couple of days later we came back to record. The song was a hit! We shared it with the rest of our friends in Bamenda, and everyone loved it and felt we should also try to shoot a video for the song during our remaining days in the country. We brainstormed ideas, and came up with the vision of lots of youth joining together in the community, all wearing shirts that expressed spiritual qualities, such as love, faith, and joy. We got the shirts made, put out a call to the youth in Awu’s community, and scheduled a day for the video shoot. Then disaster struck! The night before, Brian, Mallory, my father, and I all got food poisoning! Knowing the music video shoot was a precious opportunity that would not come again, I did my best to power through the illness, and encourage Brian to muster his energy. Brian was able to make it to the shoot, but did not have the strength to film. Thankfully, Awu was able to enlist the support of his friend Chuzih, who also shoots music videos for his profession, and he filmed the music video on the spot. With very little rehearsal, we somehow were able to make it all come together! Upon my return to the United States in January, I waited for the final mastered version of the song. Due to some complications with the files, I was told we would need to re-record the vocals for the song – a bit of a blow. It wasn’t until nearly two years later, after raising funds for my Wizdome album through Kickstarter, that I would have proper access to a quality recording studio to re-record the vocals. And then, finally, in June 2017 we decided to officially release the music video. Sometimes things move fast, other times they move slow, but the key is to keep moving! As Awu states in the song, “just like a wave, nothing can stop us when we start moving, so everybody wake up, get down with the movement!” May this song and video be an inspiration to keep moving towards your goals, even when things seem to be progressing at a snail’s pace. Eventually, you’ll make it! To download “The Movement”, CLICK HERE!